"SILVERDALE PLACE" The "STREET OF DREAMS" one of the best streets in North Vancouver! Rarely available " Hegler" built 3 bedroom rancher located in a cul-de-sac on a huge 13,137 sq. 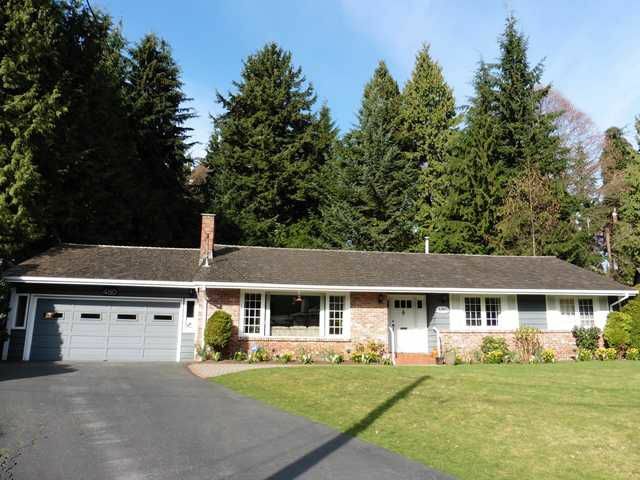 ft. level lot with a gorgeous private backyard backingonto a greenbelt and Mission Creek. What an amazing setting! Spacious layout with entertaining sized living and family rooms, 2 gas fireplaces, 2 bathrooms and large rooms throughout. Enjoy relaxing year round on the gigantic covered patio with the tranquil sounds of the creek in your private park. Hand split cedar shake roof 4 yrs. H/W 5 yrs and furnance 10 yrs. Two car garage, storage and workshop. Inground sprinkler system & fully fenced back yard. One of a kind! Truly a home to be proud of!